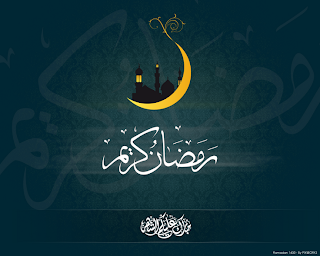 To Muslims all over the world, I wish you Ramadan Kareem! May the blessing of Allah shower upon you. Wishing you a generous and blessed Ramadan. 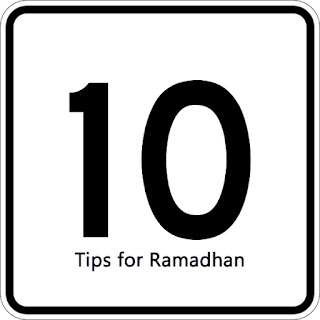 01-Discipline: Most people already know to abstain from eating, drinking, and sexual relations from one’s spouse during the daytime of Ramadhan. However, a level of discipline must be developed to do righteous acts and abstain from those acts which would earn the displeasure of Allah. 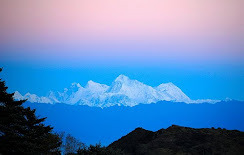 That was a basic form of discipline that needs to be developed but along with that, one needs to have discipline in following a particular routine or schedule for Ramadhan. This will be the real life changing factor for an individual. They wake up for suhoor but also pray Tahajjud at that time. Recite some Qur’an. They eat. Make dua’ while waiting for Salah. They pray Fajr. Recite Qur’an and make zikr. Rest if they need to. The idea is to make a schedule and act accordingly the whole month without sacrificing their schedule. This is the desired discipline that is required.One may ask, “Why did he not just put the first point as a ‘making a schedule’?” Well, the answer is very simple. Anyone can come up with a schedule, but it takes real discipline to abide by it. 02-Devotional life (‘Ibadah): Ramadhan is the month where Allah allows us to really fulfill the purpose of our being, and the purpose of our creation. Allah created us all to worship Him, and Him alone. Here, I will not mention virtues of various acts or worship because those can be found in the many books on the merits of certain deeds. However, since Ramadhan and Qur’an are closely connected, I will say that much of our devotional life should be focused on the Qur’an. Reciting at least the entire Qur’an once in this month. Understanding it from erudite scholarship of our community or from accepted commentaries and Tafaaseer. I am not asking that a person recites the entire Qur’an and completes one entire commentary of it in one month. Perhaps it may be feasible to recite the entire Qur’an and start off a regimen of a Tafseer and try to finish it on an annual basis. 03-Identifying with the Ummah: It is important that we feel our fast, i.e. 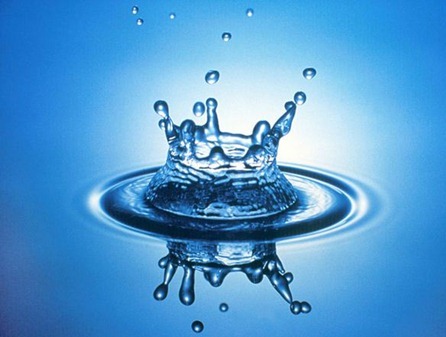 feel hunger and thirst. Apart from that, we can use this to our benefit by making other people’s fast count for us as well. 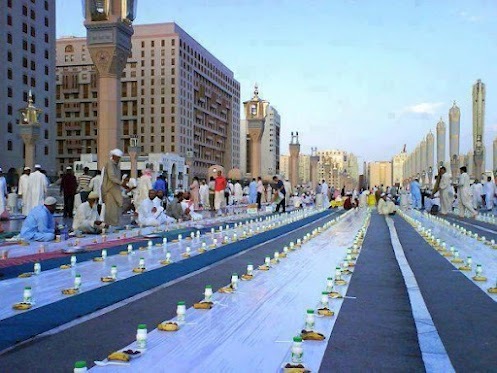 This means that if we feed or give to drink something to someone who fasts, we can get the reward of their fast as well. Another aspect of identifying with the Ummah is to be grateful for whatever Allah has given us and realize that a little of that we need to give to others so that they may have a decent Ramadhan and wonderful ‘Eid. See what the Ummah is going through and see how we can actively participate to help the Ummah in any way possible. 04-Contact with the Qur’an: Ramadhan is the month wherein the Qur’an was revealed. This is the month of the Qur’an. It is extremely essential to establish a relationship with the Qur’an. Without going into much detail, I will just mention something practical with regards to the Qur’an and Ramadhan. For the average person, i.e. one who is not scholar or is not a Hafiz, they should read at least one juz per day so that they finish at a minimum one entire Qur’an for the month of Ramadhan. If one can do more, than Alhamdulillah, no one is stopping anyone. The next thing is to understand the Qur’an. So take the first volume of Ma’ariful Qur’an (for example) and read one section of the Arabic part (if one can) and then read the translation, then read the commentary. Do this every day without fail. Obviously the whole commentary will not be completed in one month, but at least a schedule to read a portion regularly will be developed and hopefully within a year it could be completed. Also, one should try to memorize those chapters/surahs which are read often like Mulk, Kahf, Ya Seen, Waqi’ah, and Sajdah. Also memorize Surahs from the last juz at least and more if possible. 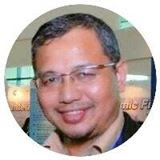 05-Mujahadah: Ramadhan is a month of sacrifice and struggle. It is a month where Allah wants our time, our health, our wealth, and our whole being. We literally live the whole year for everything and anything. 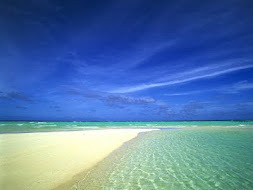 It is just one month…can we not live one month solely for our Creator?! So what if we have to sacrifice our sleep, and random other luxuries that we can do without anyway. As the saying goes, “No pain, no gain.” The amount of sacrifice and struggle we put into this month, Allah will reward us in this world and the next accordingly. Give yourself to Allah, and see what Allah has in store for you. 06-Dua’: The essence of worship is supplication to Allah. This whole month, Allah is willing and readily open to accept all that we ask of Him. It is only to our own loss and detriment that we lack in begging Allah for the things we need. Prioritize your supplications. Ask firstly for yourself, then your family, community, then the Ummah at large. Within that, prioritize and ask for things pertaining to the hereafter, then ask for things pertaining to this world. Just remember one thing when it comes to dua’, the point of dua’ is not that we need something or we need protection or refuge from some other thing, the point is that Allah told us to supplicate to Him, and that is why one should make dua’ abundantly. There are certain things Allah loves to do, and one of them is to answer the supplications of His servants who call unto Him. One final aspect regarding dua’ is crying or pretending to cry. Tears are something foreign to Allah and therefore He has immense value for tears. The whole year we become filthy and impure spiritually by sinning, Ramadhan is the month where we purify our spirits by bathing our spirits in our tears. The maximum benefit is that being with the people of Allah, Insha Allah; a person may just Attain Allah. What can be greater?! 08-Gratitude: The secret to an increase in anything is to be thankful for it. To make sure that we see this month the next year, appreciate it this year. Be thankful for all that we have in every aspect, even the basic things we neglect and take for granted. We have Iman, we have Islam. Alhamdulillah, we are the best Ummah. We have been given the best book, i.e. the Qur’an. The best way to appreciate a bounty is to use it for its purpose. Allah has blessed with infinite blessing and bounties. Ramadhan is one of those bounties, so to fully appreciate Ramadhan, we must spend it the way Allah would like us to spend it and attain out goal which is Taqwa. 09-Following the Sunnah: Anything of the beloved is also beloved. That is a principle of love. Allah has proclaimed the Prophet (Sallallahu ‘Alayhi Wa Sallam) as His beloved. If we follow the Sunnah and show a resemblance, then we can also gain the focus of Allah. Particularly follow the Sunnah acts which the Prophet (Sallallahu ‘Alayhi Wa Sallam) performed in Ramadhan. If we have to do something, might as well do it the best way possible. The best way for anything to be done is the way of the Sunnah. If by any chance it was some other way, Allah would have had His Prophet (Sallallahu ‘Alayhi Wa Sallam) do it that way then. To conclude, we pray to Allah that He accepts all of our efforts and overlooks and forgives all of our shortcomings. Aameen. 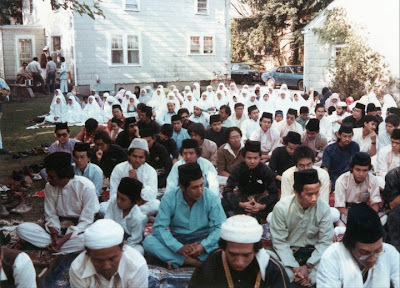 While reading posts in a facebook group, I found this old photo of me way back in 1985 listening to Eid sermon (khutbah) held outdoor at Northern Illinois University, DeKalb, USA. That's 9,274 miles / 14,925.06 km from Kuala Lumpur, Malaysia. 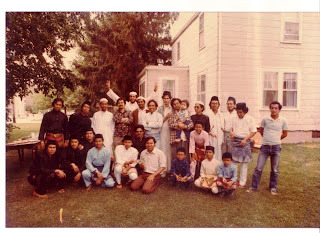 In 1988/1989, I was entrusted with the post of the Vice President of Islamic Society of NIU. Through donation, we bought a house for USD90,000 at Normal Road and used it as a Muslim House (mini-masjid), where we perform daily prayers and Friday prayers etc. I delivered Friday khutbah (sermons) several times in English and Arabic of course. Currently, Muslim sisters and brothers in DeKalb are planning to build a 'fully-fledged' mosque next to the current Muslim House. Hope I will have a chance to visit this place again, insyaAllah. 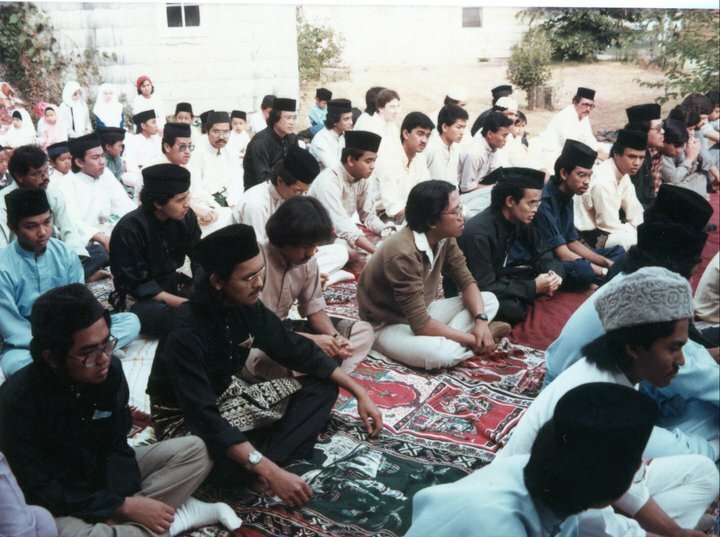 In first photo, I was sitting in the third row, leftmost (in light blue Malay dress wearing songkok). In the second photo, in the fifth row. That was 28 years ago...such a wonderful memory. Dari hadits di atas kita dapat memetik satu kesimpulan, yaitu bahwa hati ternyata laksana nahkoda sebuah bahtera. Dimana arah tujuan dari bahtera tersebut sangat ditentukan oleh sang nahkoda. Jika nahkodanya memiliki niatan dan tujuan yang baik, insya Allah akan membawa bahtera tersebut ke arah yang baik. Sebaliknya, jika ia memiliki tujuan yang jahat, maka secara otomatis kapal tersebut sedang berjalan ke arah yang negatif. Oleh karena itulah sangat penting bagi kita memiliki hati yang bersih guna menjadikan kehidupan kita benar-benar sedang melaju ke arah yang baik, yaitu keridhaan Allah SWT. Oleh kerena itulah terdapat sebuah ungkapan, bahwa siapa yang mengenal hatinya maka ia akan mengenal Rabbnya. Namun disayangkan, karena betapa banyaknya manusia yang tidak mengenal hatinya sendiri. 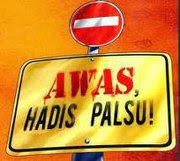 Lalu Allah menjadikannya seolah dirinya terpisah dari hatinya. 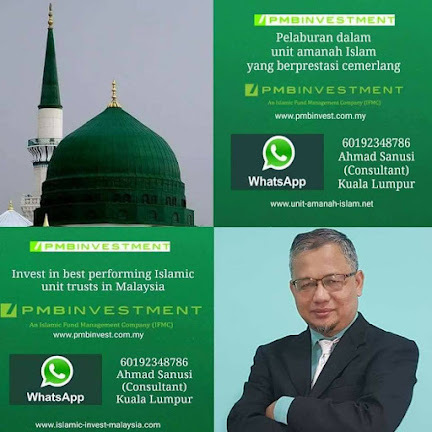 Pemisahan ini dapat berbentuk penghalang untuk mengenal dan bermuroqobatullah (selalu dalam pengawasan Allah). Dan atas dasar hal inilah, banyak ulama yang menjadikan ma’rifatul qolb sebagai dasar dan pedoman bagi orang-orang saleh yang ingin lebih mendekatkan dirinya kepada Allah. Pertama, hati yang dihiasi dengan nilai ketaqwaan, dzikir, pembersihan jiwa dan muraqabatullah (sikap hati yang selalu merasa berada dalam pengawasan Allah). Hati seperti ini, insya Allah dapat menangkal segala sifat tidak terpuji. Hati seperti ini sering juga disebut dengan hati yang bersih (Qolbun Salim). Kedua, hati yang berlumurah hawa nafsu, terselimuti sifat-sifat tercela. Hati seperti inilah yang kerap kali menjadi mangsa syaitan untuk mengobrak abrik sedikit saja sinar terang yang terdapat di dalamnya. Hati akan lambat laun akan menjadi kelam, seperti malam yang tidak berbulan. Ketiga, hati yang memiliki potensi mengikuti hawa nafsu, namun juga masih terdapat jeritan keimanan untuk berbuat kebaikan. Ia berada diantara kebaikan dan keburukan, walaupun pada akhirnya ia harus menentukan pilihan; hitam atau putih. 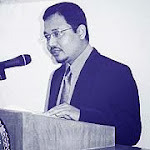 Sebagai hamba Allah, hendaknya kita memohon dan memasrahkan hati kita kepada Allah, agar hati ini terhindar dari goresan-goresan kemunafikan menuju keikhlasan-Nya yang abadi. 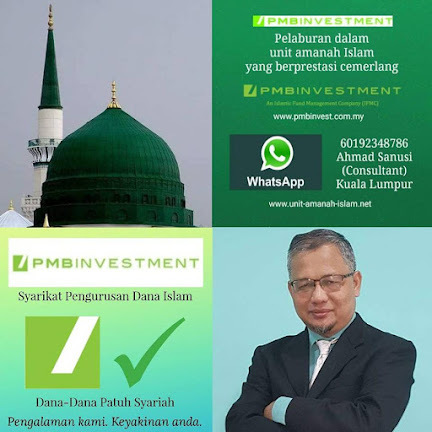 Wahai manusia, wahai diri kita, wahai para pemimpin-pemimpin bangsa, marilah kita kembali mengenali hati kita beserta sensitifitasnya, agar kita dapat memiliki hati yang suci (Qolbun salim), sebagai mana nabi Muhammad dan Nabi Ibrahim serta para nabi-nabi lainnya. … Amin. This picture was taken about 28 years ago at Northern Illinois University, DeKalb, Illinois, USA. It's me sitting in first row (third from left), in light blue Malay dress (baju Melayu). I can recognize almost everyone in the photo, the Malaysian and Arab brothers...now they are professors, director general, ceo, engineers, consultants, MP (ex), entrepreneurs and other important posts in Malaysia and overseas. I think this photo was taken in 1984 or 1985 during Eid. Some students had to sit for exam or attend class on that day, because Eid was not a holiday in USA.